In Homer's epic book The Iliad, the adventurer Odysseus confronts the giant named Polyphemus on the island of Cyclopes during his journey home from the Trojan War. Polyphemus, the Greek mythological one-eyed giant, had the bad habit of eating Odysseus's men, and threatened to eat Odysseus as well. Odysseus out-maneuvered the giant by getting him drunk and then poking his eye out with a sharp stick .... and then his men were able to escape. 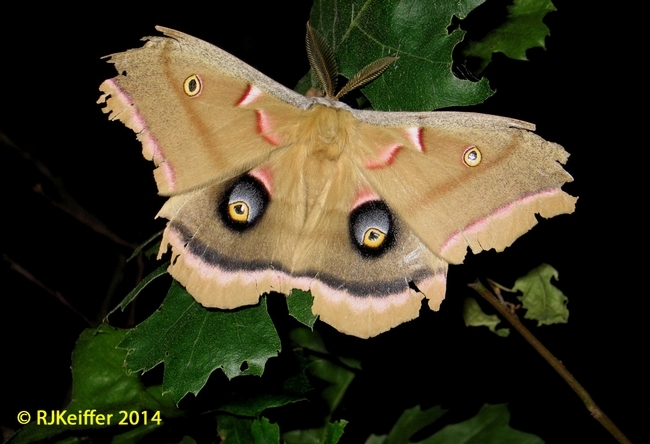 The Polyphemus Moth (Antheraea polyphemus) is a giant silk moth of the family Saturniidae. With a wingspan of 6 inches it is one of the largest North American moths. It has two large, purple and yellow colored eye spots that resemble eyes on the hindwings ... an adaptation most probably to scare away predators. It is these eye spots and its large size that led the amateur Dutch entomologist Pieter Cramer, in 1776, to name it after the Greek myth of the Cyclops "Polyphemus". The larval caterpillars go through molt 5 times, and form a pupa after the last molt that then hatches in early spring or late summer. The caterpillars feed upon a variety of tree species including, but not limited to, birch, willow, oak, maple, walnut, pear, plum, beech, and citrus. The adult moths have vestigial mouthparts (reduced size) and therefore do not feed during adulthood ... they only live for a couple of weeks to find mates and lay eggs. The females emit pheromones (chemical scents for sexual attraction) that the males sense those pheromones with their well developed plumose (like an ostrich plume) antennae. This raggedy moth pictured is a male. This species is fairly common in the oak woodlands at the UC Hopland Research & Extension Center.